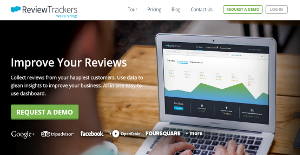 ReviewTrackers is an online review management platform that gathers and centralizes online reviews for multiple-location businesses. It is an ideal solution for any business with multiple locations that are looking for a reliable and effective way to manage reviews published in popular review sites such as Yelp, Google, Facebook, Opentable, Foursquare and 50 other websites that are readily available for customer access and distribution. The system allows users to gather the most positive reviews from their happiest customers. From this mountain of information, you can then attain insights on how to improve your products and services. You can do all these from a unified, easy-to-use dashboard. The software empowers clients by enabling them to effectively gather and share positive reviews online, work on their business reputation, and comprehend their consumers in ways that make a positive impact on their bottom line. ReviewTrackers basically gives businesses a unified platform from which they can manage and view reviews sourced from 50+ websites. Flaunting a user-friendly and intuitive dashboard, ReviewTrackers helps businesses track every major review site, such as Google, Citysearch, and Facebook, as well as industry-specific sites like TripAdvisor, Cars.com, and OpenTable. Apart from gathering reviews, ReviewTrackers also collects positive commentaries from actual customers, boosting business reputation and automatically enhancing reviews by up to 400%. The software is also built to track the performance of every store location using enterprise-grade tools and powerful reporting features. ReviewTrackers is the online review management system of choice for tens of thousands of businesses worldwide. Thanks to its enterprise-level tools and reporting, businesses are able to determine and address problems quickly and monitor the performance of each location. ReviewTrackers also boasts robust and custom reporting and analytics. These tools enable businesses to make intelligent business decisions, respond to online comments, and assess data and performance. Data can be exported to PDF, Excel or via API. ReviewTrackers also has a built-in Customer Feedback Tool, which allows users to send review requests to their happiest customers, and enhance their reviews while still allowing them to get vital feedback from all of their customers. Each enterprise is different, and can call for a special CRM Software solution that will be designed for their company size, type of customers and employees and even particular niche they cater to. You should not count on locating a perfect services that will be suitable for each company regardless of their background is. It may be a good idea to read a few ReviewTrackers reviews first and even then you should pay attention to what the service is supposed to do for your company and your workers. Do you require an easy and straightforward solution with only basic functions? Will you actually use the complex tools needed by pros and big enterprises? Are there any particular tools that are especially beneficial for the industry you work in? If you ask yourself these questions it is going to be much easier to find a reliable service that will fit your budget. How Much Does ReviewTrackers Cost? We realize that when you make a decision to buy Feedback & Reviews Management Software it’s important not only to see how experts evaluate it in their reviews, but also to find out if the real people and companies that buy it are actually satisfied with the product. That’s why we’ve created our behavior-based Customer Satisfaction Algorithm™ that gathers customer reviews, comments and ReviewTrackers reviews across a wide range of social media sites. The data is then presented in an easy to digest form showing how many people had positive and negative experience with ReviewTrackers. With that information at hand you should be equipped to make an informed buying decision that you won’t regret. What are ReviewTrackers pricing details? What integrations are available for ReviewTrackers? If you need more information about ReviewTrackers or you simply have a question let us know what you need and we’ll forward your request directly to the vendor.